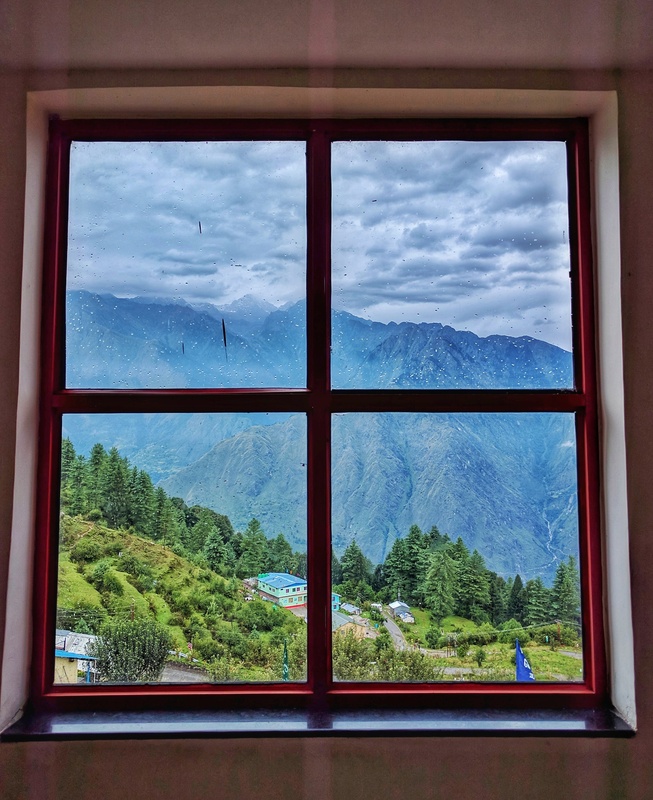 The skies were still overcast as I stood on the steps of the Garhwal Mandal Vikas Nigam guesthouse in Auli contemplating the trail that lay in front of me. It looked steep… very steep. The steepness of the trail was further compounded by the rotundity of my mortal body. Thus began a conflict that was to play out every moment for the next few days – the battle between the steep slopes and my heavy self. 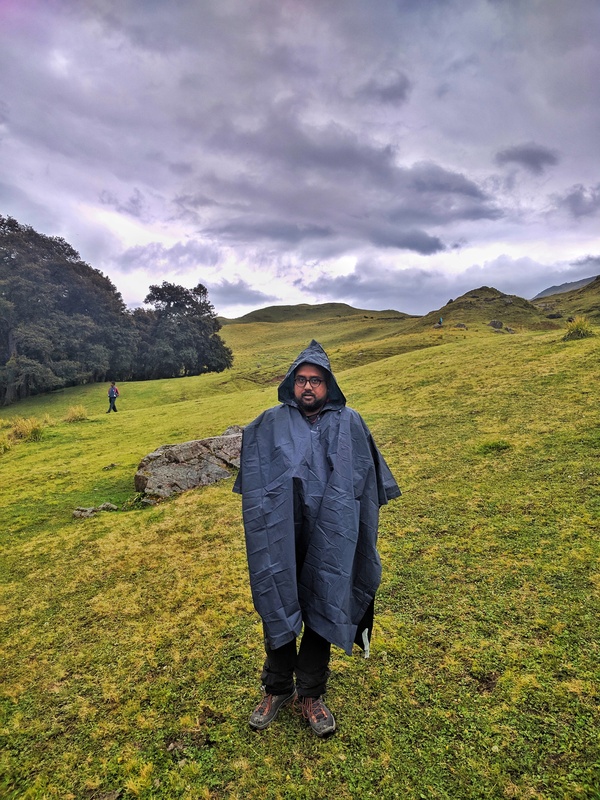 It was under these circumstances that the unstoppable force of my enthusiasm (for what I lack in physical fitness, I make up for in sheer drive) met the immovable Himalayas. The morning had begun on a pleasant note though. 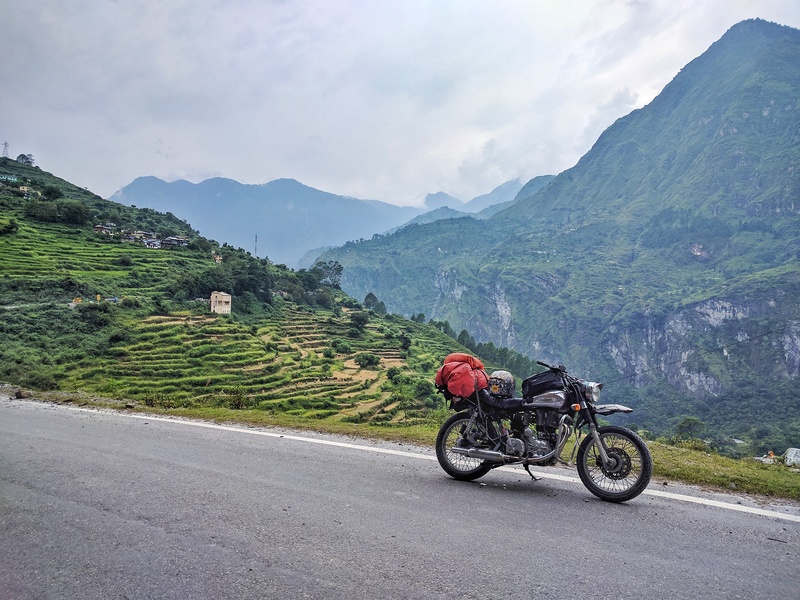 The sky was still overcast, which meant that Nanda Devi was still out of sight, but there were no aches and pains from the ride from Rishikesh the previous day. 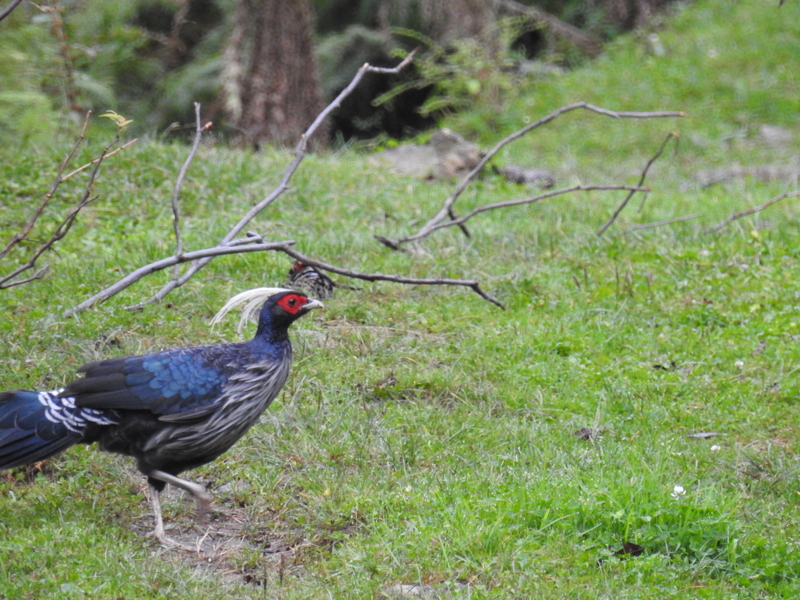 Went out for a pre-breakfast walk, and promptly ran into a Khaleej Pheasant. 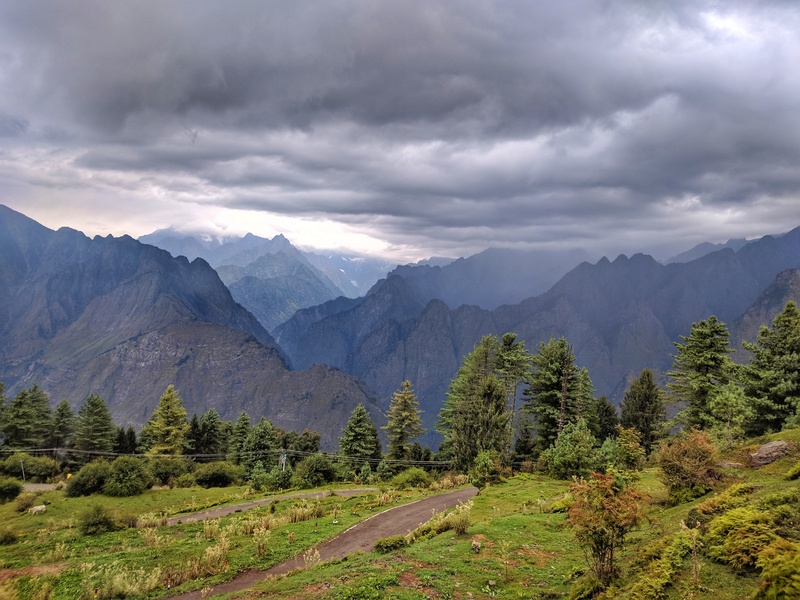 Even though the forests in Auli are rich in bird-life, the overcast skies and the constant drizzle meant the bird activity was low. And then we were to start for the trek to Gorson and we did not have the time to lie in wait for the few birds that did decide to brave the damp weather. The 3.5 km trek from Auli GMVN to our campsite on the Gorson Meadows can roughly be broken down into two halves. The first part of the trek follows the ski slopes (complete with ski lifts and the ropeway), all the way to an ancient forest. The next half of the trek takes you through the silent forest that opens up suddenly into the meadows. The climb starts right from the GMVN itself and continues uphill for a quarter of a kilometre to a tea shop and a luxury hotel before plateauing out for about half a kilometre or so. Here, to your left is an artificial reservoir, used to store water to make snow for the ski slopes during winters. On a clear day, the waters of the reservoir reflect the surrounding peaks. 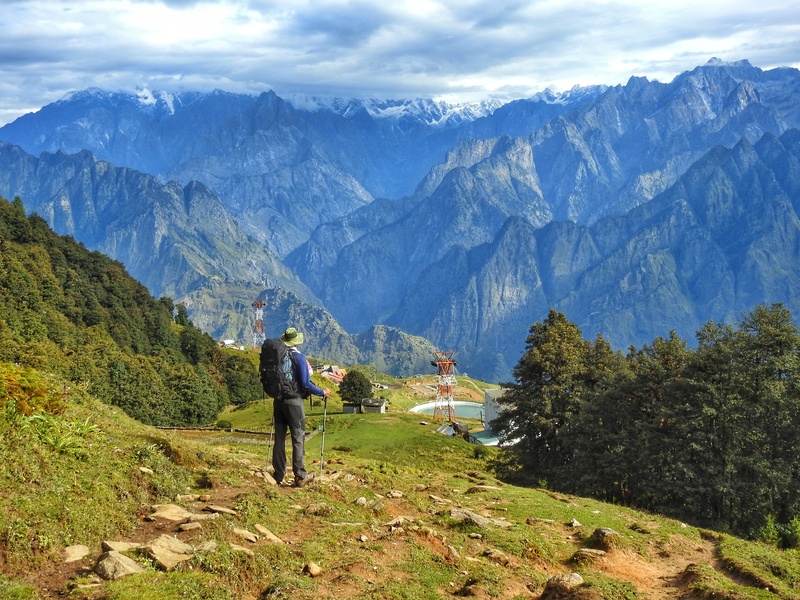 A few hundred metres from the reservoir, the trail starts climbing again towards the last point on the Joshimath-Auli ropeway. This terminal has a small tea shop where you can, if you find yourself huffing and puffing, recharge yourself with a cup or four of super sweet tea. This is also where you leave all forms of human construction behind. The trail continues upwards behind the terminal, and after another few hundred metres, you find yourself standing at the edge of Mirkwood an ancient forest populated by tall trees. 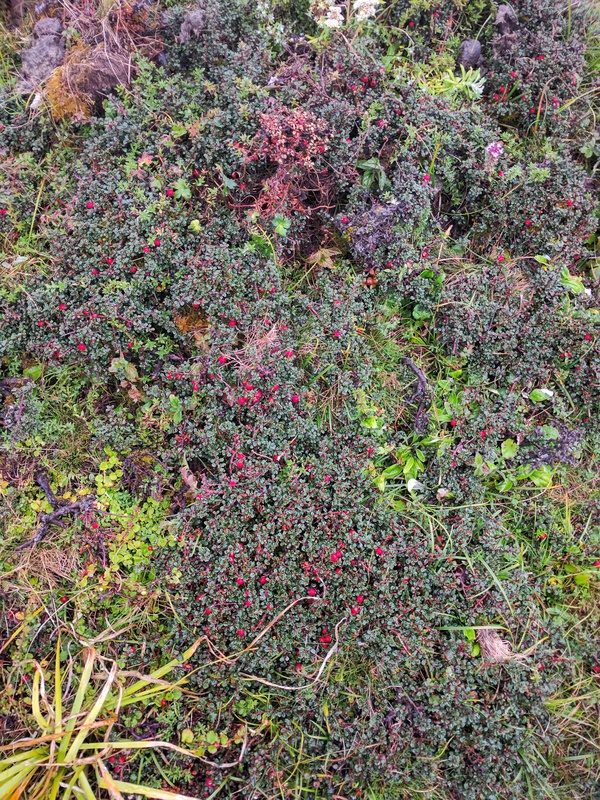 On the forest floor grows a million little flowers, only to be trodden on by crusty trekkers. The forest stands tall, solemn and sentient – like an army of mythical giants. These are ancient trees and every one of them is covered with ferns and moss. As the trail snakes through the forest, you come across the occasional fallen tree; but even in death, it is teeming with life, in the form of colonies of mushroom feeding on the carcass of the fallen giant. In this forest, nothing goes to waste. Also, did I mention the silence? Apart from the deafening chorus of the cicadas, that is. The forest suddenly opens up into a clearing and at one end of a paved courtyard, stands an old temple. 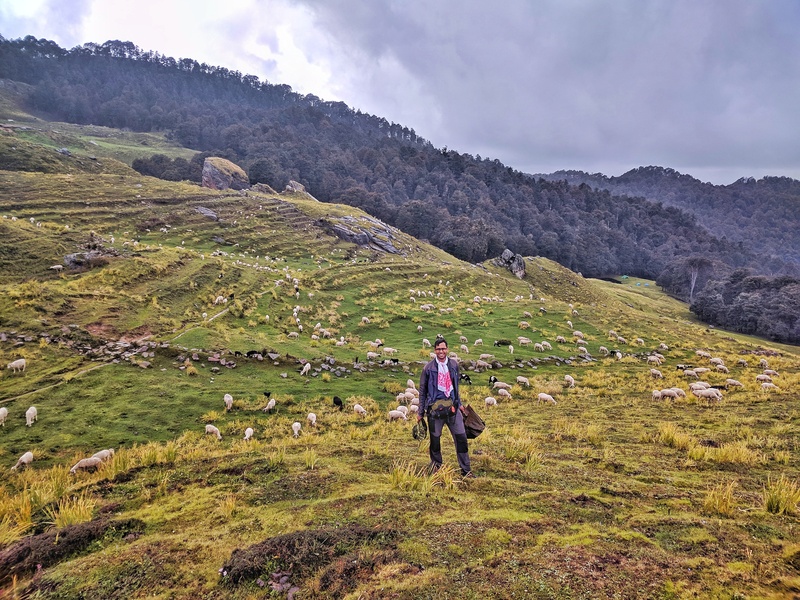 My guide tells me that when the bakharwals or the nomadic sheepherders take their flock to graze on the meadows, they generally make an offering of a red flag and some cash at the temple. Apart from the occasional shepherd, the temple also offers salvation to the tired, out-of-shape trekker as it signals the end of the trek. 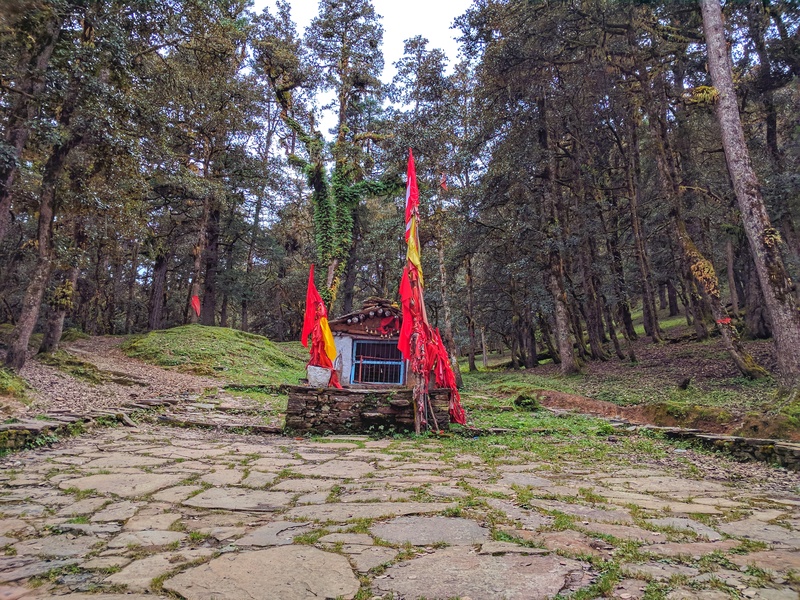 The temple in the forest. Just a hundred metres beyond the temple, the trees suddenly give way to a grassy avenue, at the end of which lies the undulating expanse of Gorson. 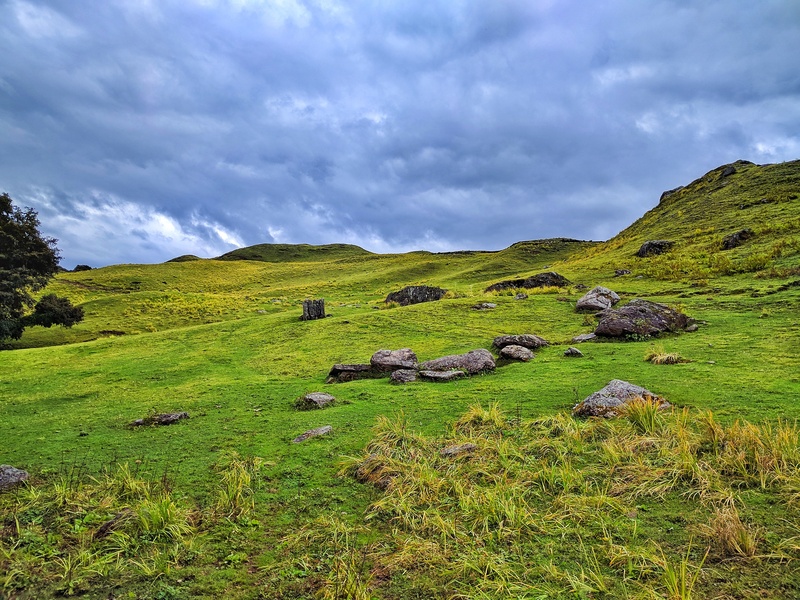 The meadows form a part of the popular Kuari Pass trek, frequented by the teeming patrons of IndiaHikes. 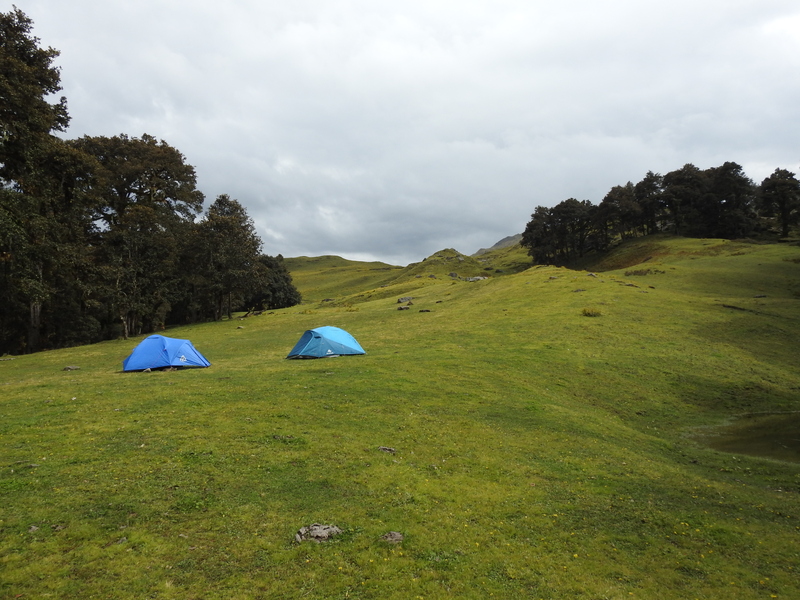 Our guide had one clear instruction: to pitch our tent as far away from the IndiaHikes campsite as possible. As soon as I emerged from the forest, the IH campsite came to view. With at least a dozen double tents and the accompanying kitchen, dining and toilet tents, the site looked less like a campsite and more like a small village. 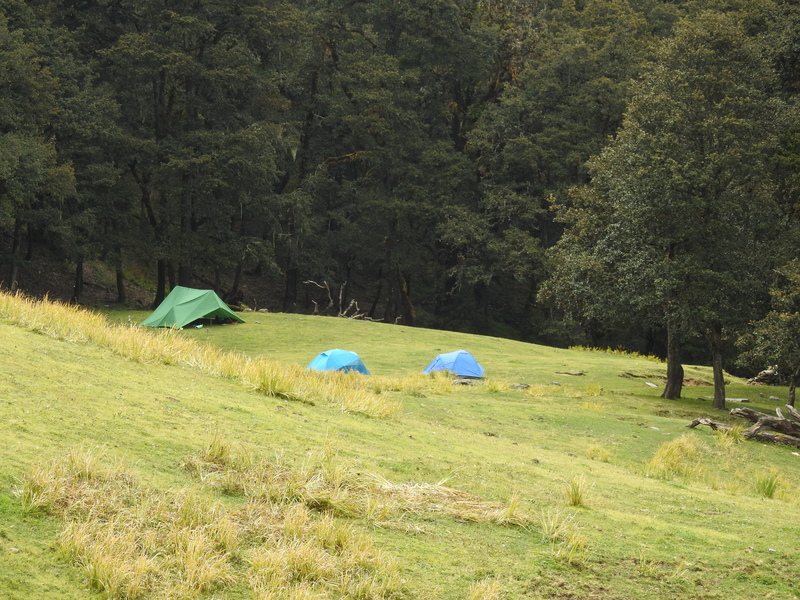 We had chosen to camp about 200m uphill from the IH village, on the edge of the forest, next to a small water body. As we were approaching our tents, the rain picked up again. Thankfully, it was only a steady drizzle – enough to keep the IH crowd in their tents and not enough to keep us in ours. Another view of our tents. In the background is the highest point in the Gorson Meadows. It was getting colder every minute and thankfully the kitchen tent was up. The cook was quick to brew up some strong tea. Anoraks on and for-tea-fied against the drizzle, we set out to explore the meadows. The entire expanse of the meadows was empty except a couple of shepherds, their dogs and their sizable flock. Dark clouds were sweeping across the upper reaches of the meadows creating a magical landscape that sent one’s imagination into a tizzy. This is the sort of setting, one imagined, where a dragon suddenly emerged out of the mist. Reality check: There were only sheep. Clouds shroud the higher reaches of the meadows rendering a magical quality to the surroundings. Wet, cold, and loving it. Gorson Panorama. Click to expand. Sheep grazing on the meadows, like tiny balls of cloud at ground level. That night, the skies opened up with an unprecedented fury. Lying in my glorified nylon bag, I was at one point of time even worried about the tent collapsing under the sheer weight of the rain. Thankfully the rain fury soon subsided and settled into the steady drizzle. 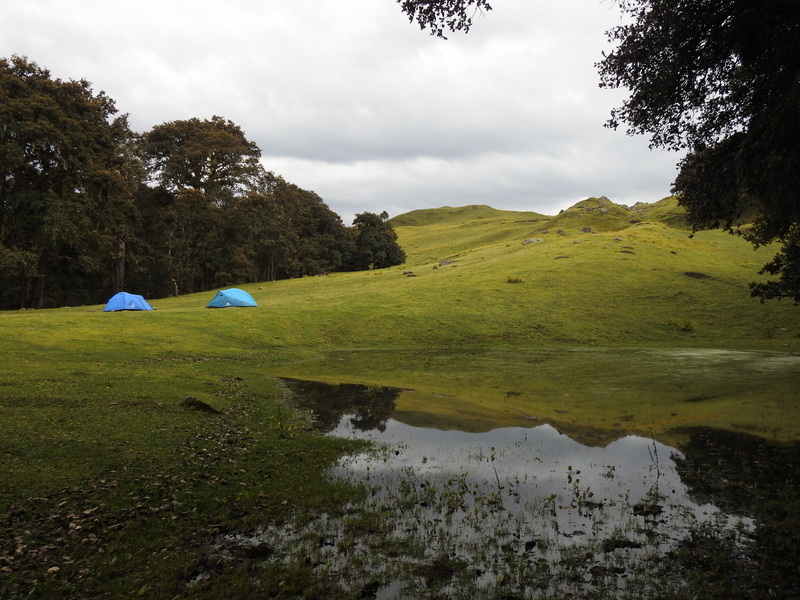 The gentle rhythm of raindrops on the nylon dome of the tent soon soothed me to a deep sleep. I opened my eyes to tent awash in bright blue light and stepped outside into a sparkling morning. There were still clouds in the sky, but there were also big blue patches… and they were getting bigger! The promise of a bright day and the downhill trek added a much-needed dose of energy to my aching body. By the time we had finished breakfast and packed up, the sun was out in all its glory. 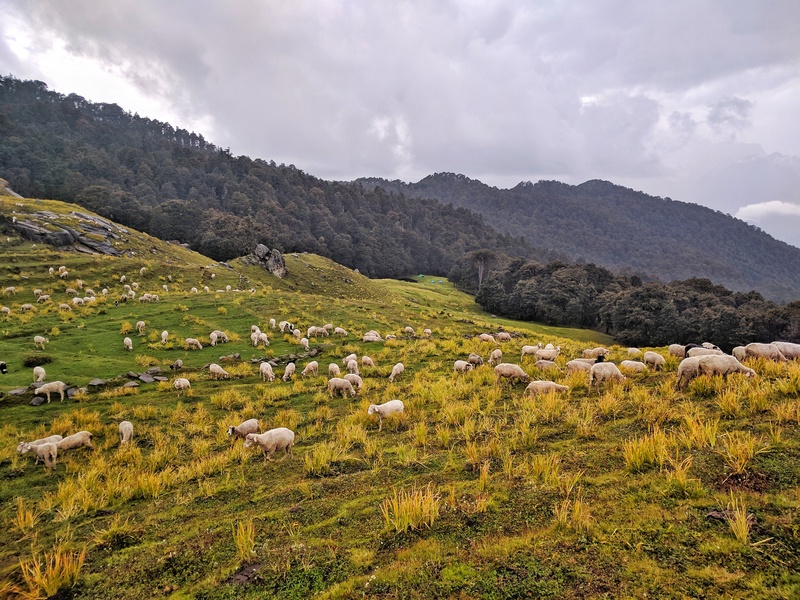 Gorson Meadows is known for its stunning view of Nanda Devi, Trishuli, Hathi and Ghoda mountains, Dunagiri, etc, but that side of the sky was still covered with clouds. Blue skies and promises of a better day. Jagged mountain and the dappled sunlight. 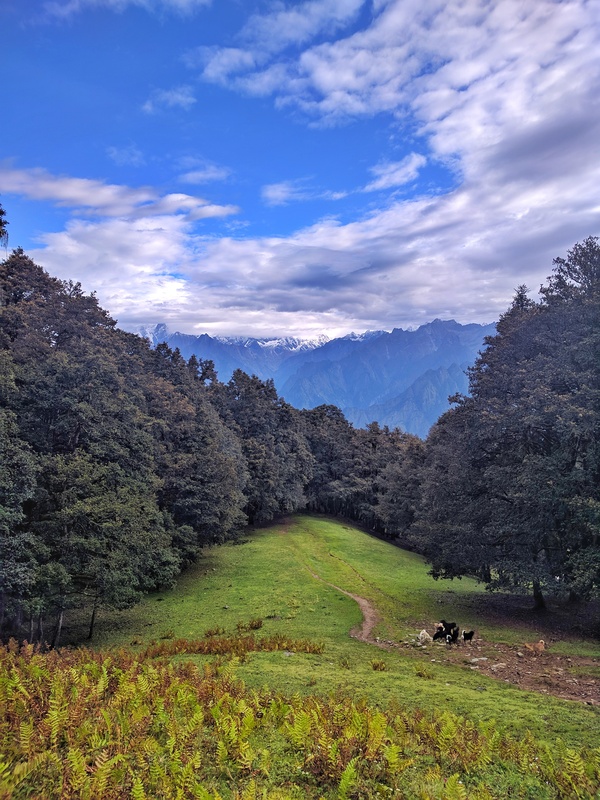 Once we emerged from the forest on the open ground above the Auli ropeway, the entire landscape looked completely different from the previous day! The slopes were bathed in bright sunlight while on the opposite side the jagged, toothy mountains looked less sinister now that they were being viewed through the ‘dappled sunlight’ filter. The grey of the previous day was replaced by a thousand shades of green and blue. Mordor had suddenly turned into the Shire. True to this change, the birds were up and going about their business. 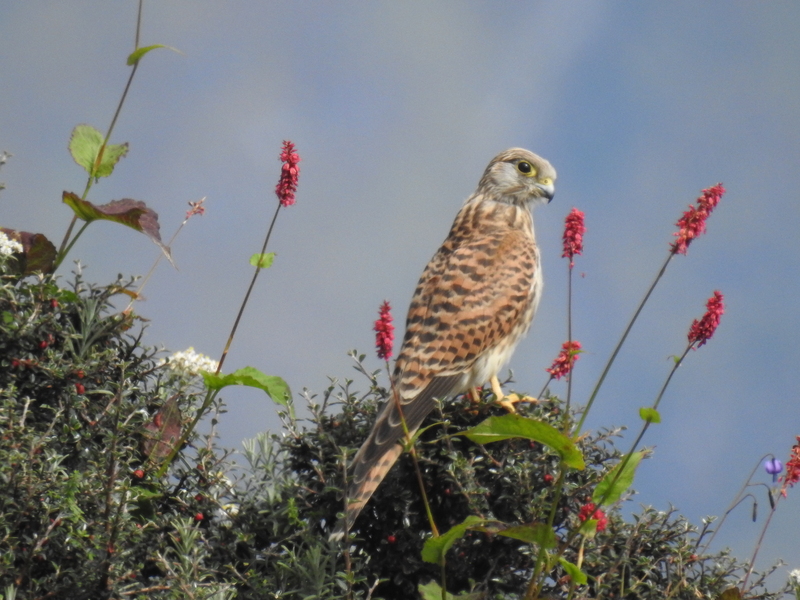 We had particular luck with a kestrel that was hopping from bush to bush in hope for a scurrying Pika or two. Further down, we also emcountered a Himalayan Griffon vulture waiting at the edge of the cliff for the thermals to rise. 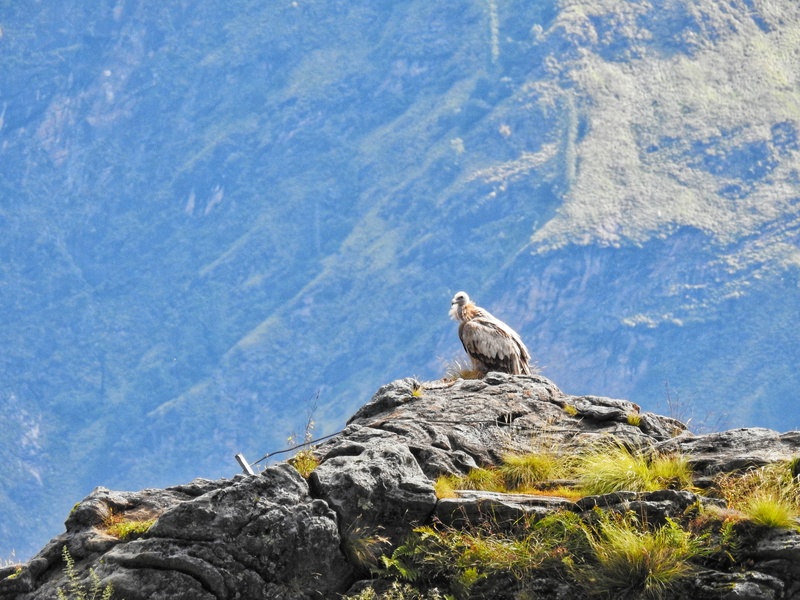 The huge Himalayan Griffon Vulture waits for the thermals at the edge of a cliff. 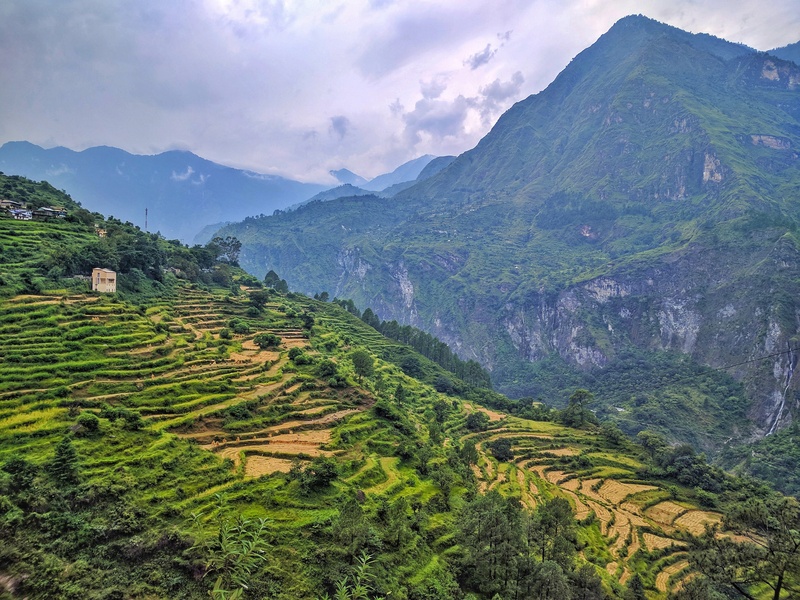 The trek to Gorson had one purpose: to acclimatise us to the altitude before we push deep into the Nanda Devi National Park. In my younger days (I can officially use this term now), the altitude had little or no effect on me, but during my ride to Ladakh in the summer of 2016, AMS hit me like the holy ghost. 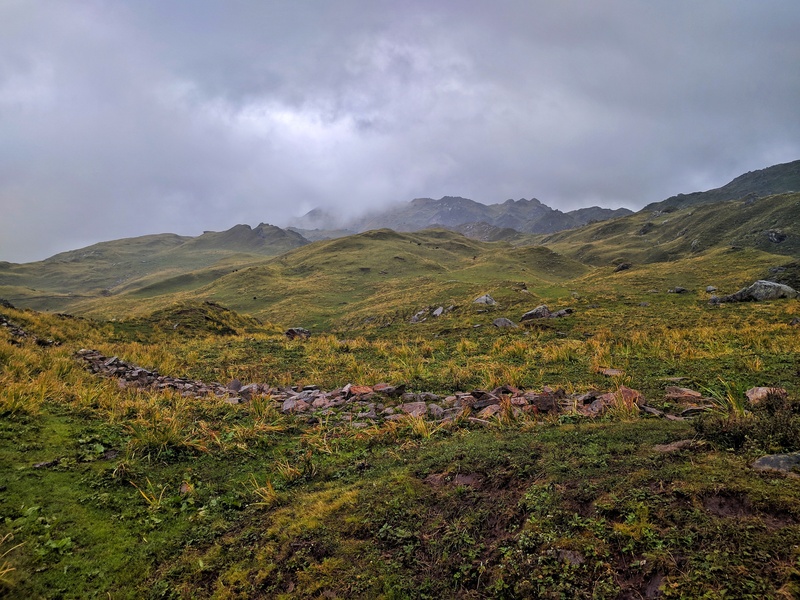 Memories of a sleepless night in a carelessly erected tent in the middle of the windswept plain of Sarchu (13850 ft) prompted me to visit the doctor and medicate myself in advance. Cannot be going through that agony again! A car would be waiting for us at Auli, ready to take us to the village of Lata, from where the trek to Nanda Devi National Park actually began. 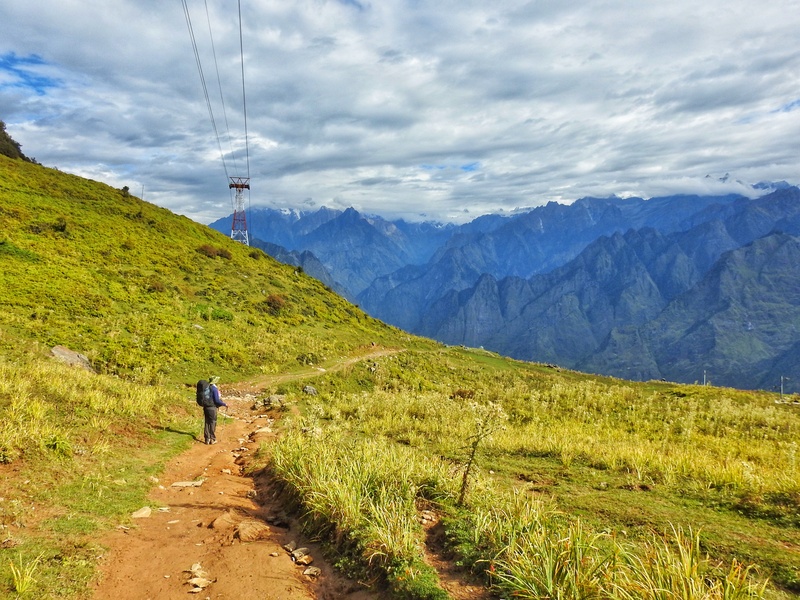 Unlike the well-trodden Kuari Pass trail, this route is off the beaten track. In fact, if your guide is to be believed, we were the first person to venture on that route in 2017. A strange darkness had started to creep in. I had always counted myself rich with an exciting job, a best friend of a wife, three of the cutest cats a person could have ever wished for – yet, there was this big gaping hole in the soul. It was as if I had been kissed by a dementor, a kiss that had sucked all the joy out of my life. A chance conversation with the wife helped me reach the root of the problem. Partly it had to do with the phenomenon called ‘adulthood’. 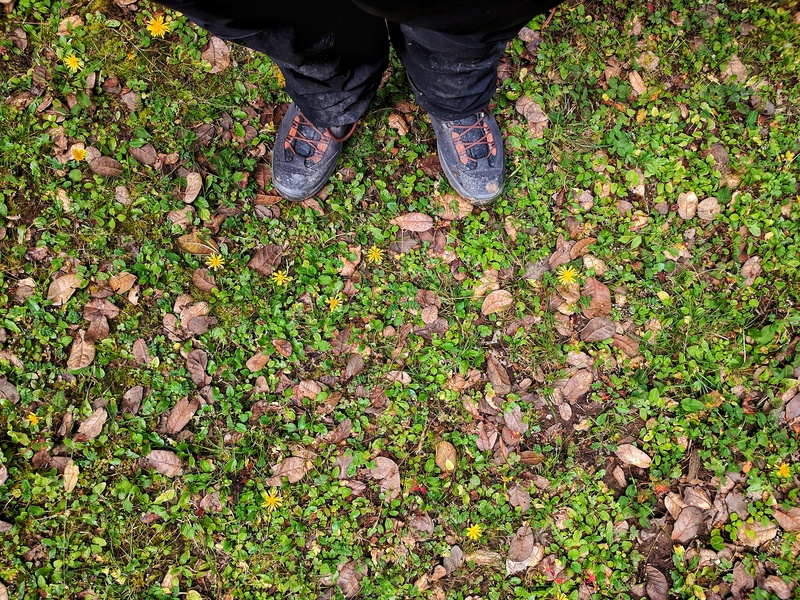 Over the last three years, I had landed myself an exciting, albeit stressful job, gotten married, and like Jude of the song, had taken upon my (not so) slender shoulders, all the weight of the world. Unlike my pre-adult life, there were no mountains; no rides on my trusty ‘Dope’, and barely time to be alone with the voices in my head. And it was this absence of this connection with myself, that had made me liken my then existence to a dementor’s kiss. Coming to this realisation was a massive change in itself. It was as if a weight had lifted off my chest… I could breathe easy… the fog of despair had lifted. Now that I knew what to do, I needed to move on to the next step: where to go? Easier said than done. Every road called out to me. Every Himalayan valley seemed to sing a siren song trying to lure me into their deepest recesses. A week’s plan soon became 10 days, and finally grew to two whole weeks. It was settled then: I would do a trek inside the Nanda Devi National Park. To do that I would need to first get to Auli, near Joshimath. This is where my motorcycle, Dope comes in. I have been on this route a few times, and from the very beginning, it was clear that Joshimath / Auli could not be reached in one day. So I decided to set off from Delhi around noon on the D-Day. The plan was to reach Rishikesh by the evening, rest up and start for Auli the next day at first light. The road till Meerut was chaotic as usual, but once the by-pass starts, it is a clean six lane cruising all the way till Roorkee. I took to the saddle after four years with a lot of apprehension. Would I be able to ride for long? Will my back give up? Would I have to turn back with my tail between my legs? Turns out nothing of that sort was going to happen. It was like fish in the water. The miles just started tumbling and the first and only break of the day came after 216 kms of riding. Once a biker, always a biker. 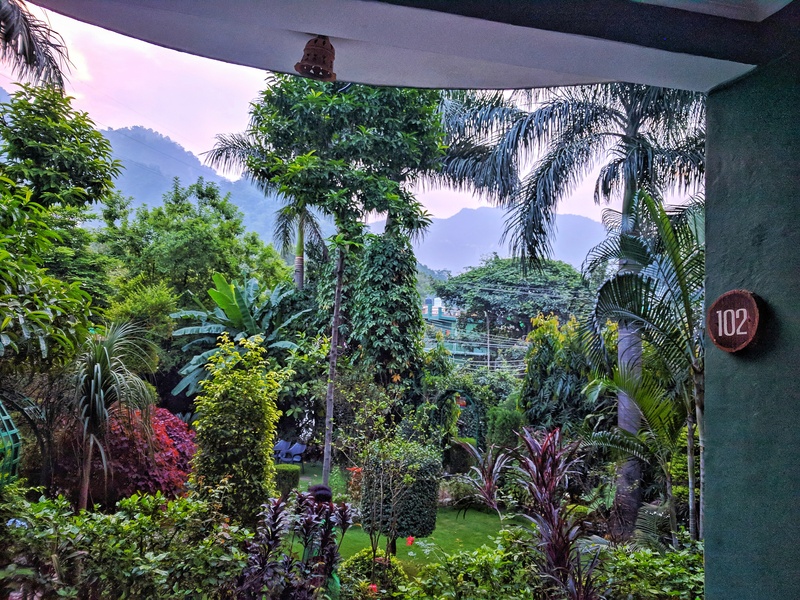 I had booked myself into Hotel Green Hills in Rishikesh. A secure parking was absolutely essential for me and this establishment had it. I also got an airconditioned room for the night at Rs 700. Another advantage of the hotel was its location right on the highway. All I needed to do in the morning was tie down my luggage and leave. Morning view from the hotel porch. The hills are just a touching distance away. Within ten minutes of leaving the hotel, I found myself finally in the hills. The monsoons had just about ended and the mountains were carpeted in a million shades of green. On my right was the young Ganga – green and eager and utterly oblivious to the abuse that lies ahead. With every turn of the road, I could feel the mortal energy return to the husk of a being I had let myself turn into. The roads were blissfully empty and the metronome-like engine note of the large single-cylinder benignly threatened to transport me to a meditative state. The infant Ganga takes her first few steps out of the Himalayan cradle. As we leave the Ganga far below and slowly climb higher, the sun finally comes out. Dope – my companion on this and many more memorable journeys. May your chrome never lose its glint! 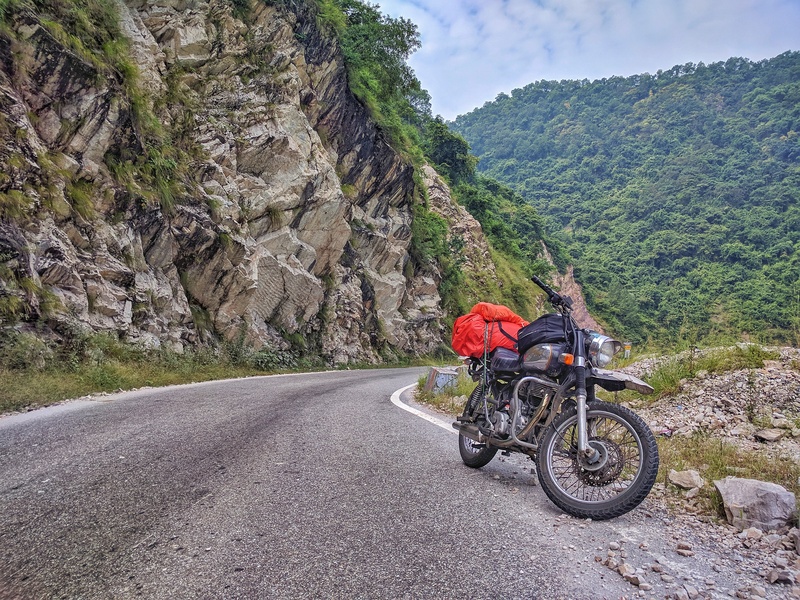 My plan for the day was to ride non-stop (photo breaks don’t count) at least till Karnaprayag. The annual yatra season had ended and I wasnt expecting a lot of traffic. The road itself was in remarkable shape. Except for a few landslide-affected stretches (inevitable in the Himalayas), the road was a poetry in smooth tarmac. Never had I seen a mountain road, (and a highway no less) in as good a shape. This is no ordinary road. For thousands of years, long before humankind had mortar and asphalt, people have travelled on this road; on foot, on animal-drawn carts and even on the backs of other people, in search of the divine. Not only does this road lead to Badrinath, one of Hinduism’s most sacred temples, along it also lie the five holy confluences, or prayags – the Panch Prayag. 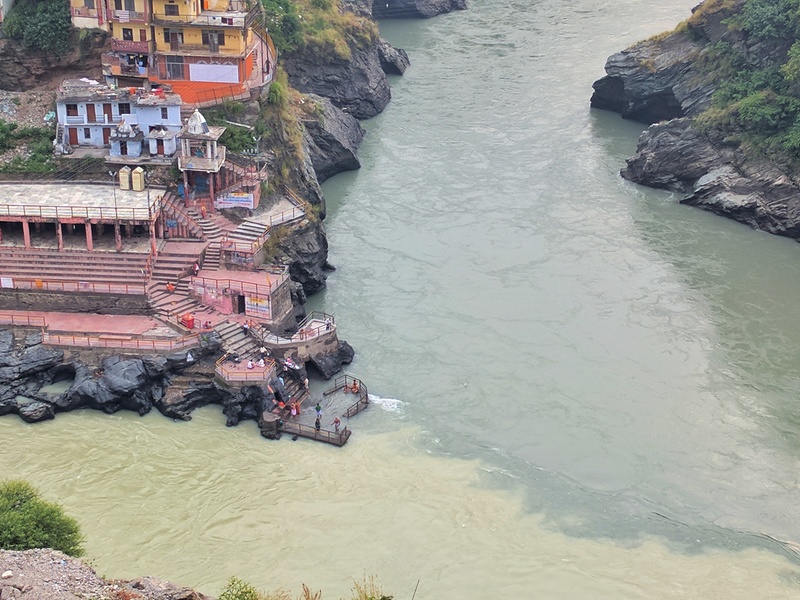 Dev Prayag: Alakananda and Bhagirathi Rivers meet here, the first of the prayags, giving rise to the Ganges. In terms of riligious significance, it is second only to Allahabad, where the Yamuna and Saraswati meet the Ganga to form the holiest prayag and hence the site of the Kumbh mela. 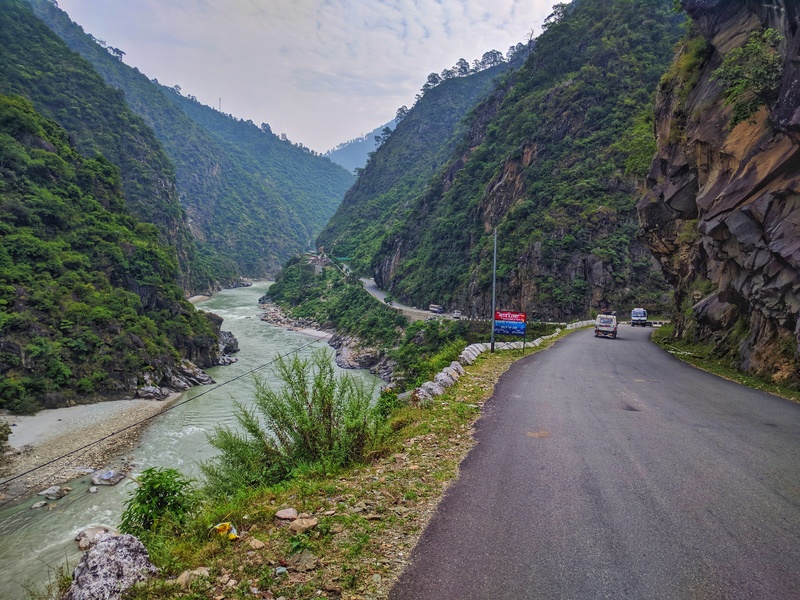 Rudraprayag: The meeting place of the Alaknanda and the Mandakini rivers. At Rudraprayag, one comes across a fork in the road and the two prongs each follow the rivers. I continue to follow Alaknanda towards the next prayag. 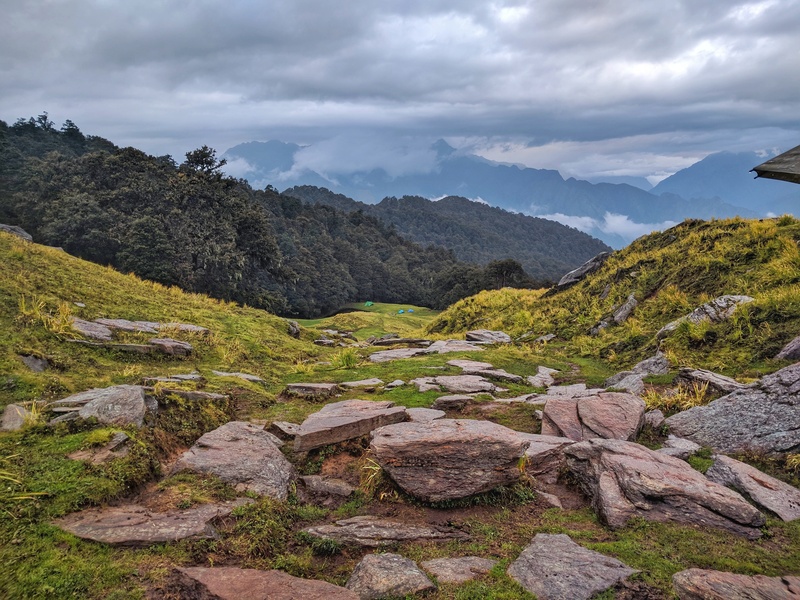 I turned left on the fork here to follow the road running next to the Mandakini on a previous journey to Deoriya Taal and a trek to Chopta and Tungnath Temple. 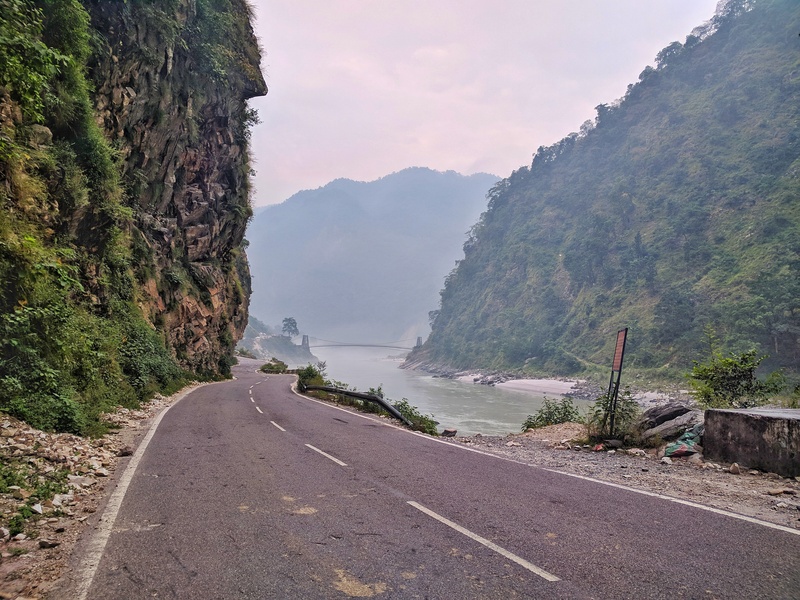 Somewhere between Devprayag and Rudraprayag (click to expand). Karnaprayag: 34 kms upstream of Rudraprayag, the Mandakini is joined by the Pindar river. Legend has it that Karna, one of the pivotal characters in the Mahabharata, prayed to his father Surya at the prayag here and in the process received the kavach (shield) that made him near-invincible in battle. Here, you cross the bridge over the actual prayag and continue along the left bank of the Alaknanda towards Joshimath and Auli. Another road branches off from the bridge towards Tharali and Gwaldham into Kumaon, a road I took on my way back and immediately went on to have one of the most fun few hours of mountain riding i’ve ever had the pleasure of experiencing. More on that later. Nandaprayag: 23 kms upstream, the Nandakini River meets the Alaknanda River at Nandaprayag. Unlike the other prayags, the confluence isn’t visible from the road here. What you can see is a maze of concrete structures and have your senses invaded by noxious diesel fumes emenating from the bus terminus. 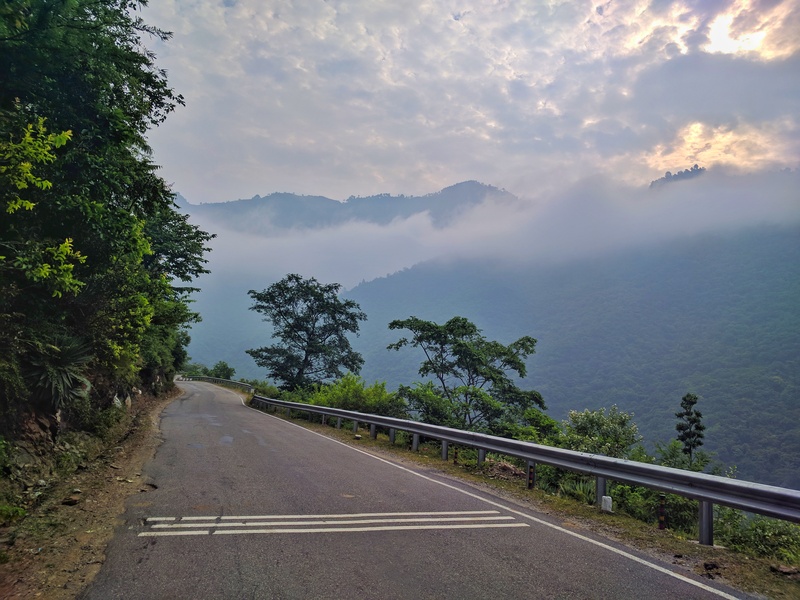 The road thus far has the river for company and follows a gentle enough gradient; but as soon as you cross Nandaprayag, things get more interesting. The roads are not as wide as you have experienced before and switchbacks appear with increased frequency betraying a rather steep gain in altitude. What a pleasure it is to ride on these roads! A short break to appreciate the surroundings. And the companion. Vishnuprayag: The last of the prayags was the only one I did not visit. This is where the Dhauli Ganga river (this river will make its appearence in a future post) meets the Alaknanda, a few kms upstream of Joshimath town. 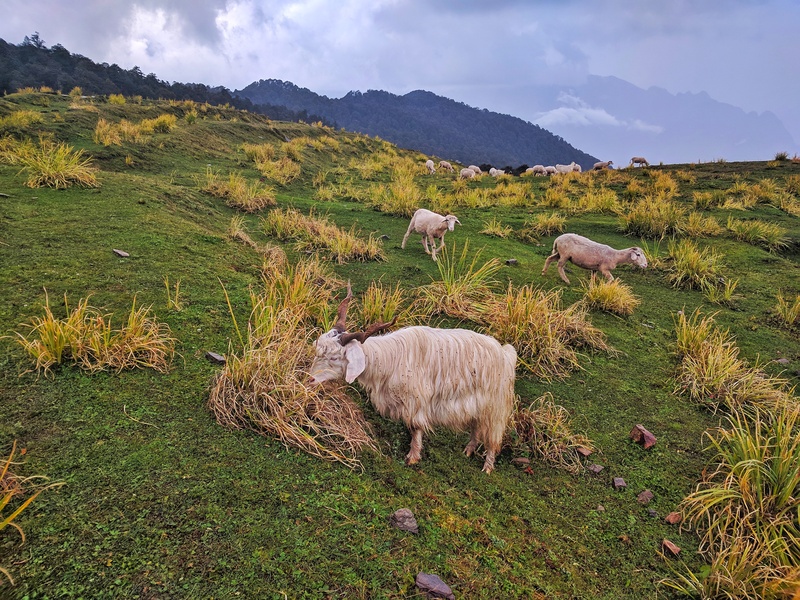 During the course of the Nanda Devi Sanctuary trek, we would be hitting altitudes in excess of 4,500 m (14,700+ feet), so it is recommended to complete an one-night accimatisation trek. 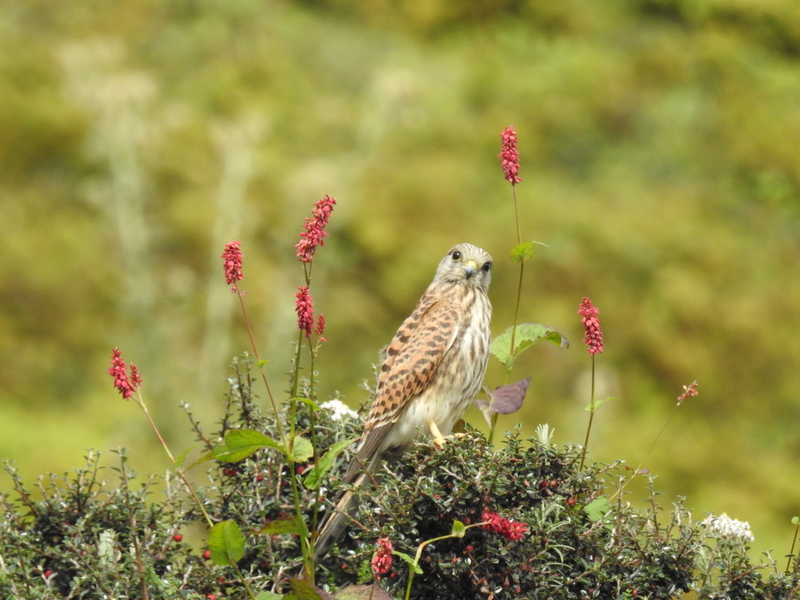 We had chosen the Gorson Meadows above Auli for this very purpose. To reach Auli, we had to take a small road turning right from the highway, a few kms before Joshimath town. 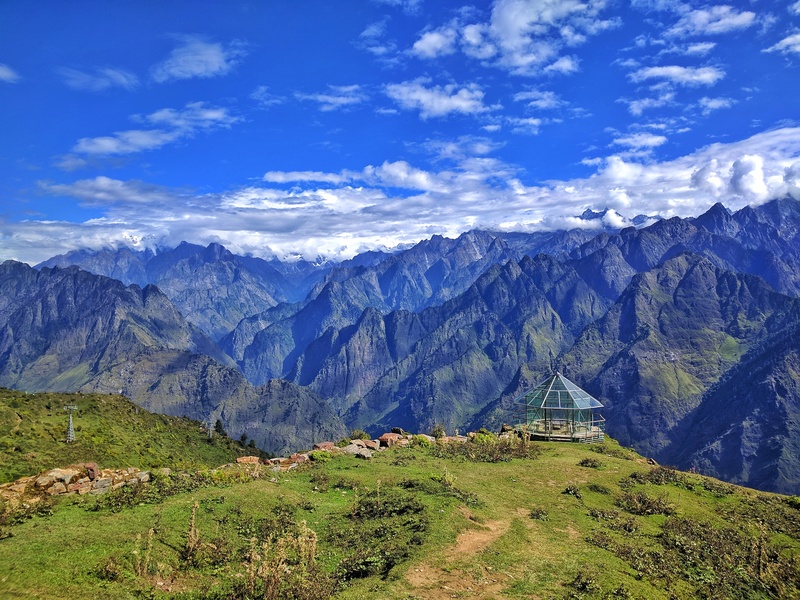 This tiny little road snakes through thick forests and a couple of Indo Tibetan Border Police encampments for 14 kms and ends at the Garhwal Mandal Vikas Nigam (GMVN) guesthouse in Auli, at an altitude of 2,500 m.
If the sky is cear, Auli offers the visitor a clear view of the iconic Nanda Devi peak (7,816 m / 25,643 ft). But this was not to be. The sky had gotten overcast as I took the turn for Auli and by the time I was unloading my luggage, it had started drizzling. 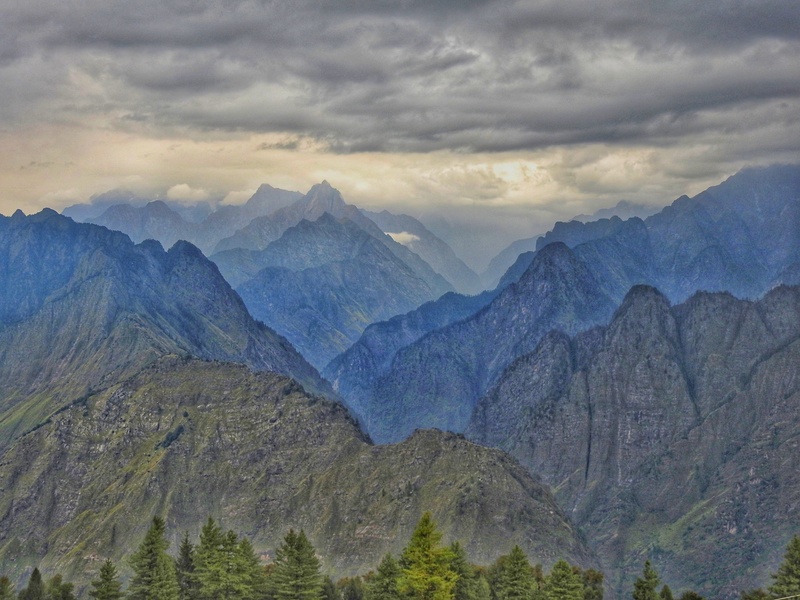 The clouds, however, did little to obscure the unique jagged-edged mountains around Joshimath and Auli. In the dying light of the day, the dramatic mountains looked like the exposed teeth of a long dead leviathan, bared menacingly skywards upon death. The black snake of a road slithers up the mountain at Auli.